These delicate filo rolls are best made a good few hours before serving to allow the pastries to soak up the syrup. They look particularly lovely scattered with Waitrose Cooks’ Ingredients dried rose petals. 1. Preheat the oven to 170˚C, gas mark 3. Make the filling first. Tip the almonds onto a baking tray and gently toast in the oven for 5-10 minutes, until lightly golden. Leave to cool slightly. 2. Put the almonds in a food processor with 100g pistachios and the figs, cinnamon, honey, egg, orange zest, rosewater (if using) and 25g butter. Pulse until the nuts are evenly chopped and everything is well mixed. Spoon the mixture into a bowl and set aside. 3. Melt the remaining 75g butter. Unwrap the filo and stack all the sheets together with one of the long sides closest to you. Using a long knife, halve the filo sheets vertically to make 12 squares. 4. Lay one square on the work surface and brush with melted butter. Put another square on top. (Keep the remaining filo covered with a slightly damp tea towel to prevent it drying out). Cut into even, neat quarters. Brush with melted butter. Spoon a level tablespoon of the filling across the bottom of each small square, leaving a 1 cm border at both sides. Fold the sides of each small square over the filling, brush with a little more butter and roll up into a cigar shape neatly encasing the filling; repeat with the remaining pastry and filling. Arrange the pastries, seam-side down, in a 20cm x 30cm parchment-lined baking tin. 5. Brush the tops of the packed pastries with melted butter and bake on the middle shelf of the oven for 40-45 minutes, until crisp and golden brown. 6. Meanwhile, prepare the honey syrup. Put the honey, caster sugar, cinnamon stick, orange zest, and 100ml water in a pan. Bring to the boil over a low heat to dissolve the sugar, then simmer very gently for about 10 minutes, until thickened and reduced by about a third. Take off the heat, strain into a bowl, add the rosewater and lemon juice and cool. 7. 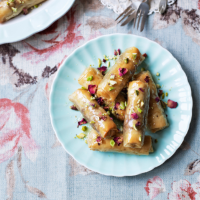 Remove the baklava from the oven and slowly pour over ½ the honey syrup. Cool for at least 2 hours in the tin to allow the syrup to soak into the pastries. Finely chop the remaining 50g pistachios and scatter over the top of the pastries, along with a few dried rose petals, if liked. Serve with extra syrup on the side.